This is "And Now Just Listen" featuring Avery, Nick, Justin and Lewes. We talk about games, tech, movies, and get sidetracked a lot. Interested in contributing? Email inquiries to andnowjustlisten@gmail.com. Before the release of the final Destiny expansion, Rise of Iron, Bungie announced their intention to bring back live events from year two. The intent is to help bridge the long gap between Rise of Iron and the full sequel to Destiny that will be launching this time next year. Last year’s events were generally underwhelming and didn’t quite freshen up the experience as much as players had hoped they would. 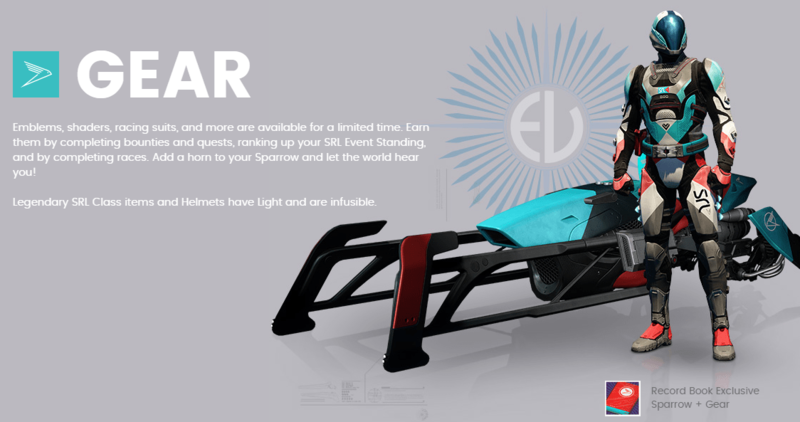 The three major live events were Festival of the Lost (Halloween), Sparrow Racing League (Christmas), and Crimson Days (Valentine’s Day). Each had their own issues, but with some adjustments they could provide some great content to keep players invested in Destiny throughout the coming year. The Festival of the Lost is Destiny’s version of Halloween and is a neat concept that would only needs a few tweaks to the existing formula in order to be an excellent offering. The festival update last year featured, a new crucible map, 16 masks to collect, and new emotes/items from the Eververse real money store. The core mechanic of the event involved equipping masks and getting kills in PvE or PvP in order to fill a candy satchel that could then be turned in for a mask and crafting item drop. After collecting many of the masks players could then complete some fun and cheeky questlines that referenced some of the major moments in Destiny and silly things that players have done or discovered. My personal favorite is the quest with a reference to players pushing Atheon off the platform in the Vault of Glass in year one. This concept is great, but emphasizes pure grinding/farming too much, thus highlighting one of the less fun aspects of Destiny’s core mechanics. Filling the candy bag only guaranteed you rare masks, which would disappear after the event ended and obtaining glue (the item to make them legendary and permanent) was difficult without spending money. With rewards that were only temporary, I felt a complete lack of motivation to spend any time on this activity. An easy way to make this event more fun is to enable all players to more easily obtain permanent versions of the masks if they want to. Another alternative would be to give out a unique weapon, class item, shader, or emblem for completing all of the Festival of the Lost quests. Some kind of permanent reward will help to motivate players to participate in the event activities and make the grind more worthwhile. SRL was a very interesting choice for the second live event. It provided players with a completely new and unique activity, bounties to complete each day, and introduced the record book mechanic that has since been implemented in several different forms. Two race tracks were created for the event and players would use their sparrow of choice in a 3 lap race. Armor drops were available for participating in the activity and this time around they were permanent from the outset, which is a big step in the right direction. The Eververse was once again restocked with new emotes and players could purchase the aforementioned record book for $10 which would track SRL stats and featured unique SRL gear to unlock. With SRL Bungie decided to try something off the wall and I really appreciate their willingness to experiment through live events. I think it was a generally successful new mode, but it could have benefited from more track variety. Learning from Festival of the Lost and providing permanent rewards was also a huge step in the right direction. Unfortunately, this event suffers because the best rewards are locked behind a paywall (the record book). The drops from the record book are much more interesting than the regular drops and locking that gear behind a $10 paywall flies in the face of providing free content backed by cosmetic microtransactions. This is problematic because it contradicts the original plan for live events that Bungie had laid out when they first talked about this new content strategy. If, like me, you coughed up the money for the record book the frustration does not end because players are required to win races in order to obtain all of the record book gear. Because Destiny wasn’t built for racing, there was some very inherent strangeness to SRL (i.e. weird geometry hang ups, crazy physics, etc) that made winning with skillful driving difficult. Easing the requirement to top 3 finishes would have been nice, so that those of us that did pay could more readily obtain the rewards presented to us. That being said I would argue that players should be able to purchase the exclusive drops or earn them, not both. Paying for the privilege of attempting to earn better looking armor is a gross practice that does not respect players time, or money. Despite these complaints I thought SRL was a positive step for the live events team in many ways and it had me excited about whatever would come next. The Valentine’s Day event, Crimson Days, not only featured the most slapdash content addition of the live events, but also takes home the prize for most uninspired rewards. Crimson Days introduced a hybrid of the Doubles and Elimination PvP modes as it’s sole piece of content. All quests and bounties were for the new mode and it was the only way to obtain the rewards for the event. The event only lasted for a week and I was able to obtain the top tier rewards (a ghost shell and shader) in one day of playing. There’s not much to say about Crimson Days, because of how uninspired it felt. It provided minimal new content, that content was not terribly interesting, and at the end of the day the whole thing felt like an unneeded excuse to refresh the Eververse in order to sell more emotes. The most disappointing thing about Crimson Days was that it failed to not only innovate or try new things, but felt like it threw away all the lessons learned from the previous live events. Festival of the Lost and SRL felt significant and offered players interesting activities, and rewards to earn. Crimson Days felt like it was cobbled together because the team needed to get something out the door after promising players a somewhat steady drip of content. If events were happening once a month this would have been more acceptable, but when events are only dropping every 2-3 months they need to be more significant than one, sort of new, crucible mode. The April Update wasn’t a traditional live event, but I wanted to mention it briefly because it was a positive addition to Destiny and put together by the live team. In this update Challenge of Elders was introduced, a new strike was added, an old strike was freshened up, and new gear was added to the loot table. This update added a significant amount of new content and the changes introduced were all positive, breathing some life into the game when it had stagnated quite badly. Small updates like this are something I would love to see more of between now and Destiny 2, but I think that we’re unlikely to get more than one (we may get none) as Destiny 2 is now the number one priority at Bungie. More than anything this update eased my concerns with the live team’s ability to deliver and has me looking forward to potential improvements to this year’s events. Live Events are a great idea and something that Destiny needs to keep things fresh and engaging. None of the seasonal events were perfect, but two of the three were good and have the potential to be great with some small changes. The April Update exceeded my expectations and delivered a nice batch of new activities to the game, which is something I would love to see more of. Hopefully, the team at Bungie has learned from last year’s events and will deliver a batch of improved experiences for us this year that deliver new activities and worthwhile rewards. If they fail to do so it’s going to be a long wait for Destiny 2, even for the most dedicated of players.